^ Editorial, Reuters. 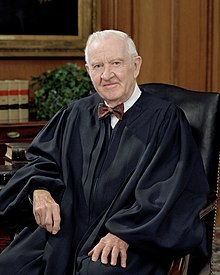 "Kavanaugh does not belong on Supreme Court, retired Justice Stevens says". Reuters. Retrieved 2018-10-05. ^ "Trump nominates Brett Kavanaugh to Supreme Court". ABC News. 2018-07-10. Retrieved 2018-10-04. ^ Segal, Jeffrey A. "Perceived Qualifications and Ideology of Supreme Court Nominees, 1937-2012" (PDF). Retrieved 2012-04-04. ^ Liptak, Adam (2010-04-10). "Justice Stevens, the Only Protestant on the Supreme Court". The New York Times. ISSN 0362-4331. Retrieved 2017-11-10. ^ "Supreme Court Justice John Paul Stevens Retiring". Retrieved 2018-08-21.